A completely rotten picture of my absolute favourite corner. This is where I blog, write letters, do my makeup, do my hair, pretend I'm a popstar etc. 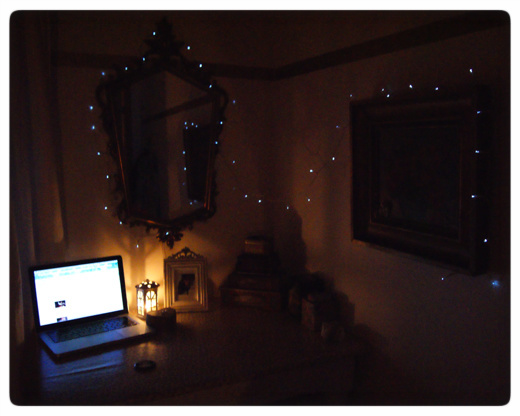 I like it the most when it's dark cause it makes the fairylights so much more cosy and that much more enchanting. I love decorating and often change little bit ands bobs in my room. This desk has looked very different throughout the years but this is what it currently looks like. It's my favourite corner in the world. Aw this is sweet :) I like the fairy lights!